Within the pages of the books in this series are heartwarming stories of love, uplifting stories of courage, and inspiring stories of faith. These are extraordinary true stories told by ordinary, and not-so-ordinary, people from all walks of life. Each title is centered around a specific theme, and each is packed with more than 50 stories. - Publisher Within the pages of this book are over 50 heart warming stories of love, courage, and inspiring displays of faith. All have been drawn from the Guideposts Magazine and are told by extraordinary people from all walks of life. Told in the compelling first-person style they each relate to the specific theme of Mothers and would make a lovely gift. 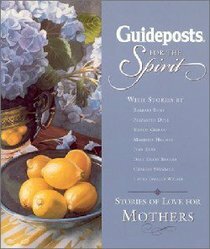 About "Guideposts For the Spirit: Stories of Faith For Mothers"
Within the pages of this book are over 50 heart warming stories of love, courage, and inspiring displays of faith. All have been drawn from the Guideposts Magazine and are told by extraordinary people from all walks of life. Told in the compelling first-person style they each relate to the specific theme of Mothers and would make a lovely gift. Loving Gestures; Words Of Patience; Words Of Comfort; The Best Example; Being Strong; Letting Go; Love Your Daughter; Love Your Son; Remembering Grandmother; Of Mother And Home; The Essence Of Mother Love; Thought Of Motherhood.